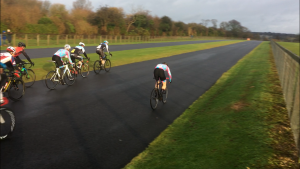 Sean Townsend (VC Equipe/FlixOralHygiene/Propulse) returned to Odd Down for the first time this series, and snatched the win from the sprinters by the finest of margins with his solo escape. The men’s 2/3 race had seen a flurry of moves attempt to get clear as all the main favourites for the overall series and the win on the day marked each other closely. 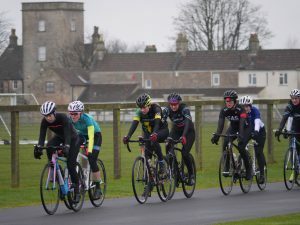 This was until Townsend made his move, just as an escape with series leader John Russell (Bristol RC), 5th overall Andrew White (Okehampton CC) and Bath CC’s Charlie Shields were brought back. Russell had been on the attack early on as well, getting clear with his rival for the series title, Charlie Revell (Team Tor 2000 Kalas). However, with two such prominent riders attacking, the bunch were not giving them any room and they were quickly back in the group. Steve Cottington (Bath CC) was the next to try and get away, quickly followed by Townsend, who was joined by Oliver Beresford (VC Venta) and Rob Borek (Forever Pedalling). Townsend’s companions dropped off the pace and, after being briefly joined by Beresford’s teammate Thom Hayward just clear of the bunch, he was brought back by another move, this time from Revell. For all this surge-and-stop racing, no move had gained more than a few seconds’ advantage, until with just under four laps to go Townsend final got clear. With two laps to go he had 11 seconds advantage, with Sam Holder (Forever Pedalling) attempting to bridge from the peloton. As Townsend took the bell his gap was down to seven seconds with Hayward leading the bunch, the result hung in the balance. Townsend hung on though, taking the win less than a second ahead of Borek and Revell who were second and third. Borek’s teammate Rob Hardyman (Forever Pedalling) was fourth ahead of Colin Smith (Army CU) and Russell. Revell’s third place means he re-takes the series lead from Russell by 10 points with three rounds to go. Hardyman climbs up to 5th, only a single point off the podium in a close three-way fight between himself, White and Will Page. The women’s E/1/2/3 race again proved to be the most aggressive of the afternoon, with the lead riders taking no mercy in shredding the group. The riders were biding their time until Meg Dickerson (Forever Pedalling) lit the touchpaper with a strong solo move. Maria Powell (Radeon-Cycology) responded to lift the pace and no sooner was Dickerson back in the group, Illi Gardner (Veloflow) made her move. Gardner has rapidly climbed the overall standings with a win and a second place finish, and so she was given no room by series leader Lauren Johnston (Avid Sport). Gardner and Johnston have been closely matched in the past couple of weeks, covering each other’s moves, and the pair set to work to establish a gap to the rest of the field, who were no strung out behind them. Gardner has had the edge on Johnston both times, with perhaps greater experience and a snappier sprint making the difference. But she wasn’t waiting for a sprint this week, attempting to catch Johnston out on the final lap. Johnston is a tenacious rider though and did not falter as she held Gardner’s wheel. It looked as though this may cost Gardner as she led into the final straight, but she used her track experience to set herself for a short 100m jump for the line that Johnston could not match. Despite falling short of the win again, Johnston can be satisfied as she built her overall series lead out to 95 points with only a maximum 150 remaining to be won. If she finishes ahead of second overall Rebekah Nash (University of Bristol) next week it will secure her the overall series win with two rounds to spare. Nash climbs above Jenny Bolsom (Bikechain-Ricci) who is now third, closely followed by Gardner who continues to accelerate up the standings, moving from 7th to 4th place this week. It is shaping up to be a close fight for the podium with the top seven in the standings all very close overall. The men’s 4th cat race has been an attritional affair all series, with a battle for the riders further back in the group to stay in touch and a fierce pace at the front dissuading anyone from making a bid for freedom. This week however, the benign weather conditions seemed to lull the race into a more controlled tempo. As the race approached the midway point the probing attacks started, with first Matthew Skeats (University of Bristol) and then David Guy (Southdown Velo) trying moves. With three laps to go Alex Joy (University of Exeter) and Theo Brumhead (Bristol South CC) made a move, but once they were brought back it was Guy who moved clear again. Guy didn’t look fully committed initially, but once he saw he had a gap he set to work, pursued initially by Robert Francis (Somer Valley CC). Guy’s lead never grew beyond five seconds, and it looked like his move would be in vain, with the bunch only a single second behind with 500m to go. However, the lead riders in the group tried to reposition themselves for the sprint, and Guy was able to hold onto his lead, crossing the finish just ahead of Brumhead who took the sprint by half a wheel from Marin Barea (Wheal Velocity). There was also no hanging around for the sprint in the women’s 4th cat race. Heidi Blunden (Racing Chance) set a hard early pace to set herself up to make the first attack of the race. She was brought back by Kate Millard (Clevedon RC) and it was these two riders along with Olive Holliday (Somer Valley CC) who were prominent in the first half of the race. However, the rest of the field had been lying in wait, poised to make their move. As they took the bell, Sarah Durrant (Raptor Racing) put in a huge move, instantly getting a gap to the rest of the group. Aimee Parsons (Avid Sport), took a moment to find clear space ahead of her front wheel before jumping across the gap to the leader. Durrant was committed to the move and quickly pulled out a two second lead on the chasing group. However, as the leading duo entered the final 500m, the gap had begun to close and it looked like it would all come back together. Parsons was alert to the situation though, and sprung away just before the catch was made. This gave her a gap that the group could not respond to and she improved on last week’s second place to take her first ever win in only her fourth race. 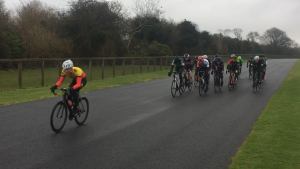 Holliday showed the excellent sprint that secured her third last week to take the sprint for second ahead of Millard and Sally Crocker (Salt and Sham CC). Durrant’s brave move was unfortunately swallowed up by the group, as Blunden and Sue Allen (Probello-Carb Cycles) came by her just before the line.